Robert “Bob” Weyker passed away at Harbor Campus in Port Washington after a 14-month battle with end stage kidney disease on Thursday, April 11, 2019. He was 79 years old. Bob was born in the Town of Saukville on September 21, 1939 to George and Eleanor (nee Buchholz) Weyker. Bob was employed at Gilson Brothers for 33 years. Prior to his employment, Bob served in the United States Army and was honorably discharged in 1964. Much of his time was spent volunteering, whether it was for a brat fry, flag day or other event. He was a patriotic man who was very proud to have been an American Legion member of Fredonia Warren Kane Post 410 for over 50 years. Bob had another love in life which was his family. Although he did not have children of his own, he cared for his nieces, nephews and great nieces and nephews as if they were his own. He was a giving, selfless man who willingly helped others with a smile on his face. He will be dearly missed. Bob is survived by his brothers Eugene (Darlene) Weyker, Ronald (Mary) Weyker, sister Virginella Klapat, nieces Stephanie (Jason) Elliott, Jennifer (Vladimir) Roman, Sharon Casper, nephews Brian (Linda) Weyker, Steve Casper, great-nieces and nephews Kian Elliott, Kyle Johnson, Kayla Johnson, Kameron Johnson, Kelsey Roman, Mitchell Weyker, Caitlyn Weyker, Luke Weyker and special friend Rose Graham. Bob is preceded in death by his parents, sister Dorothy Foster and niece Michelle Weyker. A Mass of Christian Burial will be held at Divine Savior Parish - Holy Cross Chapel 5330 Hwy B Belgium, 53004 on Thursday, April 25, 2019 at 6:00 PM. Father Neil Zinthefer will preside. Bob’s family will receive visitors from 3:00 PM until the time of Mass at 6:00 PM. An American Legion walk-thru will take place at 5:00 PM. 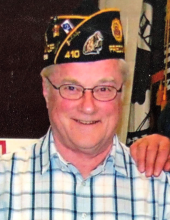 Bob will be taken to his final place of rest - St. Rose of Lima Cemetery in Fredonia on Friday, April 26, 2019 at 10:00 AM where full military honors will be observed. In lieu of flowers, memorials are appreciated to the American Legion Fredonia Warren Kane Post 410. Bob’s family wishes to extend a special thank you to Dr. Fitzsimmons, Dr Alfred, Sharon Trompeter RN, the staff at DaVita Dialysis Mill Street Clinic in Cedarburg, Aurora Hospital Grafton, the Harbor Campus staff and Seasons Hospice for all the care and compassion they provided Bob. To send flowers or a remembrance gift to the family of Robert "Bob" Weyker, please visit our Tribute Store. Guaranteed delivery before Robert "Bob"'s visitation begins. Guaranteed delivery before Robert "Bob"'s mass of christian burial begins. Guaranteed delivery before Robert "Bob"'s graveside begins. "Email Address" would like to share the life celebration of Robert "Bob" Weyker. Click on the "link" to go to share a favorite memory or leave a condolence message for the family.